I've written before about how I am on my kids' elementary school's committee to make our dream of a sustainable, healthy learning environment for our kids, a reality. One of the aspects that our committee is addressing is adding a Farm to Table lunch program that is complimented by a culinary arts curriculum. As we investigated this further and looked at the culinary arts at a nearby school, I realized that once again I was underestimating my children. Not only was I underestimating my children, I was being lazy and taking the path of least resistance that in turn was handicapping my children's development. So, the Frowzies have begun a new experiment. 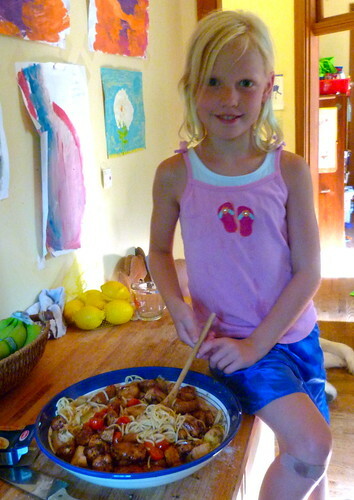 Each week, each of my children plan the meal that they will be cooking. 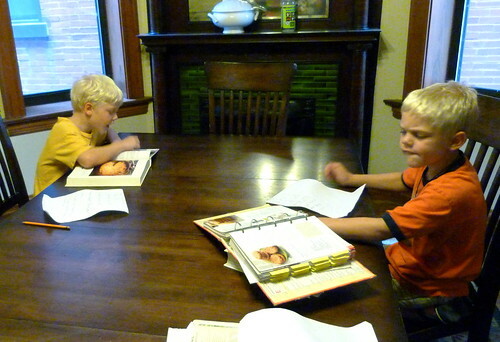 I give them several cookbooks to go through and give them nutritional guidelines and then let them go. They pick an entree, 2 side dishes, and a dessert. Then they make a grocery list from the recipes. My two 8 yr olds and my 7 yr old do this on their own. I help the 4 yr old pick and write her grocery list. At the grocery store and farmer's market, they pick up the things on their list which leads to a whole other level of nutrition discussions. I had never spelled out for my kids why I bought certain things over others. They didn't know what "organic" meant. or "free-range." or "anti-biotic and hormone free." It led to some fascinating conversations! 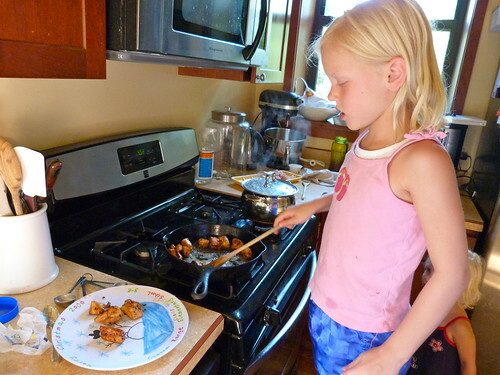 In the kitchen, I work right beside each child as they prepare the meal. I teach them how to chop and how to sautee, roast, broil, etc. It was a bit earth shattering to realize how capable and mature the kids really are. They aren't my babies anymore. And they absolutely love getting to cook "their dinner." They are so proud of what they have done, and goshdarnit, I'm really proud of them, too. When they serve the meal, the kids get to talk about what they did and how things went. They established the rule that everyone must try at least one real bite of everything that their sibling prepared. I get a little misty when they praise each other about the meals, because let's face it, some days those moments are few and far between. And I'm not going to pretend that I haven't already thought ahead a couple of years when 3 nights of the week I won't have to cook dinner.